An online art movement is transforming fashion-obsessed dolls into confidence-boosting toys for young children everywhere. Australian artist Sonja Singh kicked it off with her Tree Change Dolls. Ever since she began rescuing Barbies, Disney princesses, and Bratz dolls from second-hand stores and repurposing them into make-up free “outdoorsy” characters, artists around the world have been following her lead. Bobby Jean, an artist in Spokane, Washington, has decided to transform the heavily made-up Bratz dolls who don revealing outfits into companion characters for under-represented groups of kids. In the video below, she creates a doll without hair in a hospital gown that could comfort a child during her chemotherapy sessions. She plans to auction the doll to raise money for a children’s cancer research hospital. A Canadian artist named Wendy Tsao has been auctioning her reimagined dolls to raise money for charity as well. She converts Bratz dolls into cultural role models like author of Harry Potter, J.K. Rowling, and Nobel Prize laureate Malala Yousafzai, as part of her Mighty Dolls art project. Tsao wanted kids to have alternatives to fashion and fantasy role models. 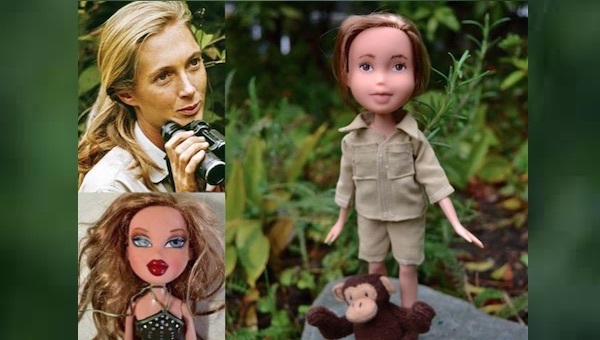 She promises to give 30% of the proceeds from her Jane Goodall doll (pictured above) to the primate researcher’s institute.